The murder of Alex Murphy in Paul Verhoeven’s ultra-violent 1987 Robocop still ranks as one of the most disturbing scenes I have ever seen. This time around, the studio handcuffed director Jose Padiha to a PG-13 rating in hopes of recouping the $120 million dollar budget even though Padiha and star, Joel Kinnaman fought for an R rating. The result is a film with an entirely different tone that goes for a strong punch in the arm rather than the jugular. The premise is mostly the same as the original. Set in a dystopian Detroit in the year 2028, Alex Murphy (Kinnaman) and his partner Jack (Michael K. Williams) get too close to drug kingpin Antoine Vallon’s (Patrick Garrow) operation. After a car bomb detonates, Murphy is critically injured giving mega-corporation OmniCorp a chance to unveil its capacity to create a part man, part machine police officer. OmniCorp has had success with similar ambitions by planting robotic “peacekeepers” in military hot-zones throughout the world. These giant, armed intimidation machines wander the streets bellowing phrases like “May peace be upon you” as they continuously scan the area for threats. US citizens are happy to have these things keeping peace in other parts of the world, but they have not warmed up to the idea of having them within their own boarders. With much hesitation, Murphy’s wife, Clara (Abbie Cornish) agrees to allow OmniCorp to go ahead with their plans to use Murphy as a way to sway public opinion towards a robotic police force. “Dead or alive, you’re coming with me.” Screenwriter Joshua Zetumer takes these words to heart by writing a screenplay that has too many ambitions but still manages to take the audience for a ride. While the original film had two feet firmly planted in satire, this sci-fi, action, satire, political drama, morality play, crime story doesn’t quite know what it is. Regardless, it has sufficient doses of each of those to summon enough enjoyment for the movie to come across as surprisingly fun. The film also looks very good and it’s a credit to director Jose Padiha since his heightened budget is certainly on full display. While occasionally delving into video game style action, most of the “futuristic” touches are done with seamless realism that do not force the audience to zone out. This has been the case with too many action films of recent years, most notably, another 80’s retread (and coincidentally also a February release) A Good Day to Die Hard from last year. Another credit to Padiha is that this film is far better acted than it has any right to be. 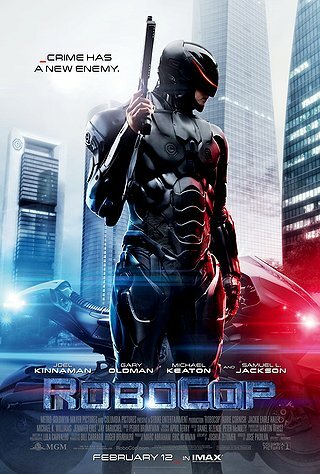 Kinnaman is a great Robocop and supporting roles from Gary Oldman, Michael Keaton, and Jackie Earle Haley are strong, energetic, and believable. However, the most surprising and enjoyable performance comes from Samuel L. Jackson channeling Bill O’Reilly as reality news anchor and personality, Pat Novak. Novak spews absurdly biased opinions on his show, The Novak Element, and Jackson sinks his teeth in and does not let go. I’d watch an entire movie about this character alone. Robocop is rated PG-13 and has a running time of 1 hour and 57 minutes.